Dr. Bruce Vannatta came to Southern California after attending Indiana University for both his undergraduate and medical degrees. He completed his residency in San Francisco and then his fellowship in Cardiology at the University of California at Irvine and Long Beach Memorial Hospital. He delayed his entry into private practice to complete an extra year of training and Interventional Cardiology. Dr. Vannatta is certified in Internal Medicine, Cardiovascular Disease and Interventional Cardiology. He specializes in coronary and peripheral artery interventions. In addition, he implants permanent pacemakers and does ICD post-generator changes. He is also a strong proponent of reducing overall cardiovascular risk. In his spare time, Dr. Vannatta enjoys spending time with his wife and dog snowboarding and surfing. He is also one of the few physicians who tries to commute to work on a bicycle on a regular basis. Georganne Cashdollar was born and raised in Long Beach, CA. She graduated from California State University, Dominguez Hills with a Bachelor of Science degree in 1998. In 2001, she earned her Master of Science and Nurse Practitioner Certificate from California State University, Long Beach. She was a member of Sigma Theta Tau International Honor Society and she is a certified Advanced Cardiovascular Life Support Provider. 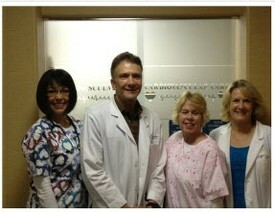 Georganne has been employed at Long Beach Memorial Medical Center since 1980 and works in the Heart Institute. She has been Dr. Bruce Vannatta’s nurse practitioner for the past ten years. She sees patients both in the office and hospital, monitors stress echocardiograms, performs pacemaker interrogations, and monitors his Coumadin clinic. Georganne has two daughters and enjoys travelling, kayaking, and going to concerts and the movies.